MILWAUKEE (AP) Freddy Peralta is making it difficult for the Milwaukee Brewers to remove him from the rotation. Maybe they won’t. 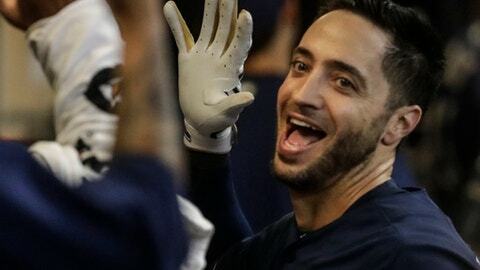 Peralta pitched one-hit ball over seven scoreless innings, Jesus Aguilar hit one of Milwaukee’s three homers and the Brewers beat the Kansas City Royals 5-1 on Tuesday night. Peralta was called up in May and allowed one hit in 5 2/3 scoreless innings in his debut, striking out 13 in a 7-3 win over Colorado. He gave up four runs in four innings without a decision in his second start, and then was sent down. Brewers: CF Lorenzo Cain was placed on the 10-day DL (left groin strain) and OF Keon Broxton was recalled from Triple-A Colorado Springs. … LHP Boone Logan was released. … 3B Travis Shaw, who left Sunday’s game against St. Louis in the middle of his first at-bat, was not in the lineup and is day-to-day.